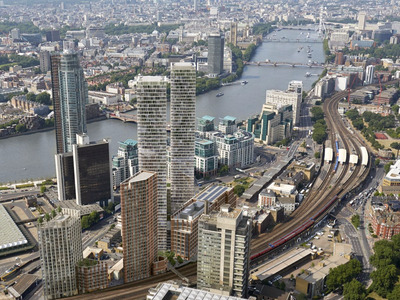 New London ArchitectureThe glut of developments in London’s Nine Elms region have been hit hard by the slowdown. Luxury property developers in London are getting so desperate to sell flats, they’re offering “stamp duty paid” discounts to tempt buyers, according to the building consultancy firm Arcadis. FTSE 100 developers like Barratt Developments and Berkeley Group are taking part in the scheme, the Financial Times says, adding that on a property costing £800,000 ($1.5 million), buyers would get a £30,000 discount. The report adds that developers will incur a 7 percentage point hit on margins for “super prime” flat sales, which comes to about £36 million ($52 million) on a sale of 70 apartments. Developers usually have a “typical profit margin of 20%,” said Mark Cleverly, a partner at Arcadis to the FT. So why the discount? The problem comes down to the new stamp duty tax having a major hit on demand, leading to an oversupply in the luxury home market. Luxury homes, which carry a hefty price tag, would incur a massive amount of fees. Stamp duty is a tax placed on buyers when they purchase a property in the UK. It is payable on completion of the property and under the new system, it works out at an extra £93,750 if you’re buying a property at £1.5 million , according to the government’s stamp duty tax calculator . However, if you’re buying a property for £5 million, you’ll be forking out £513,750 just in stamp duty fees. If you own more than one property, a 3% stamp duty is applied. This new fee came into force on April 1 and is applicable to buy-to-let investors and those who are buying a second home. This 3% fee is on top of the extra cost of a new purchase in April. The amount of “prime” London homes in construction over the next decade is expected to hit over 35,000, according to the Arcadis Property Pipeline report, but developers have already been hit hard by Chancellor George Osborne’s new property tax. To speed-up the delivery of affordable housing and ensure the construction sector remains sustainable, the Chancellor must impose a temporary reduction in stamp duty on new build properties. In tandem with this, he must better focus the debate onto ensuring acceptable levels of affordable housing are delivered as part of new development. But it’s not just luxury developments that have been affected. As Business Insider previously reported, the new stamp duty resulted in a 45% slowdown in all property purchases in April, after a rush of purchases to beat the deadline in March. This has resulted in an intense surge of property price rises prior to the tax rule change. According to Land Registry figures, the average London homes crossed the £600,000 mark — but there are fears the impending slowdown could turn into a crash, with potentially thousands of new luxury developments forced to sell for way under the expected price.